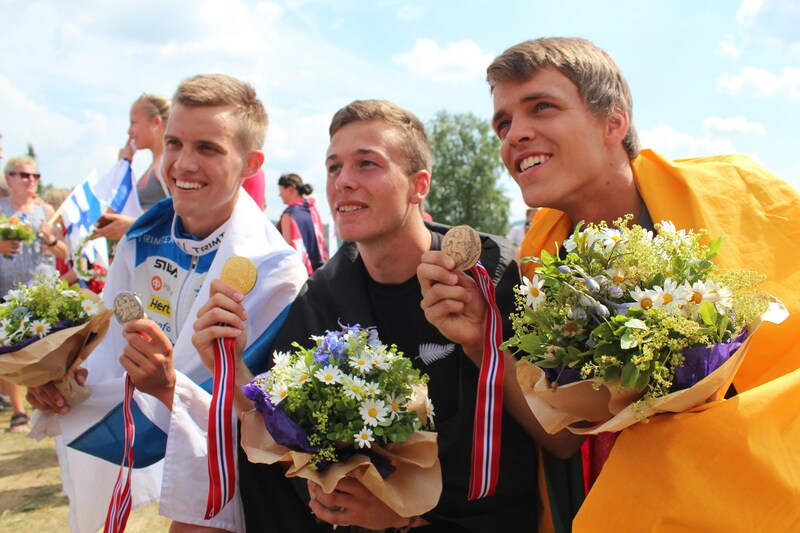 Tim Robertson has written his name well and truly into the history books of orienteering, with a stellar run into GOLD in the sprint distance held today in Åmot. On a course that proved to be physically challenging, with difficult route choice legs, Tim ran away from the field, leading from start to finish, to claim a second successive gold medal at JWOC, and a third successive medal: unheard of at JWOC level in the mens grade, and only beaten by Ida Bobach in the women. The map was an interesting mix of residential area, forest of varying runnability, a small school and some urban area. The most interesting part of the sprint was the use of EMIT touch free, which meant that there would be no stopping to punch at controls. You could simply run as fast as possible past a control within 75 cm, and it would punch. This would add a new element to the race, as it increased the importance of flow, and meant that it would be a continuous running race, as apposed to a normal sprint where you get a little rest at each control. Our fallen hero – Cam Tier, painstakingly mapped the embargoed area, to provide us with significant insight into what we were to expect in the course. His map allowed us to speculate as to the start and quarantine areas, and to plan courses helping with route decisions and what we could expect from the terrain. Tim and I were on the last bus, which gave me super special insight into the mind of a soon too be double world champion. Relaxed as ever, Tim and I were discussing how people deal with nerves. It was so interesting to watch all the different people on the bus, those who would avoid all eye contact, those who tried to play down their capabilities and those who tried to play them up. Especially when Tim arrived, all eyes seemed to be on him. Not a bad confidence booster going into a race. From quarantine, we began with a long run (1300m), that twisted its way through forest and around houses, down a hill to the start, in the scorching sunlight, before flying off into the forest for the first control. Leg two was the first test for both courses, a long route choice leg across the map, with one alternative being shorter but with more forest, and the other being longer but faster running. One of the key aspects of the race was being able to pick a fast route choice that might be a bit longer in distance, but that could be faster to run in the terrain. Leg 3 was a simple leg to set up leg four, which was another route choice leg across the map. This was a tricky leg, with it being quite hard to see the fastest option. 5,6,7 and 8 were simple 50/50 legs that required fast decision making to execute well, whilst running fast on the hills. 9 was the next test, another long leg which took some time to figure out the fastest option. After that it was down into the arena, which was like running into a wall of sound, the Kiwi’s of course being the loudest of them all, especially when Tim ran through in the lead. Under the tunnel to the last loop of the course, which was brutal, under the hot baking sun and the steep sharp climbs up to control sites. It was about pushing as hard as possible, with reasonably simple legs to finish the course. The final 290m of pain in the finish chute was brutal, taking us under the road and then around the arena, with hundreds of people cheering you on. It is a feeling I’m sure none of us will ever forget, for those of us running our first JWOC, for those of us having a solid run early in the week, and for those of us who took the top step of the podium.